One of the things you have to know about me: I love cake. Baking a cake is one of my favourite hobbies and eating it makes me even happier. 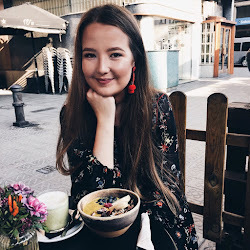 I practically live at this hotspot in Amsterdam where they serve the best red velvet cake and at home I don't mind to spend hours in the kitchen creating the best baked goods. One of my last creations are these raspberry cheesecake muffins and I have to say they are the best thing ever. They are super moist, airy and delicious. 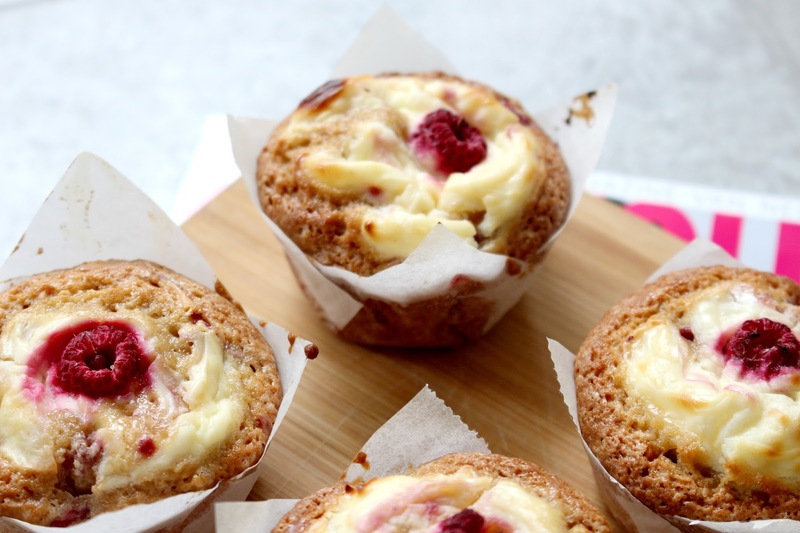 The cream cheese on top makes it even better, because who doesn't love cheesecake and a muffin combined? Preheat your oven to 190C. Put the flour, salt and baking powder in a large mixing bowl. Also add 225g of the caster sugar and mix it all together. Then add the eggs, sunflower oil, vanilla extract and milk. Mix it all together until you get a smooth mixture and use a bit more milk if needed. Add most of the frozen raspberries and slowly stir them into the mixture. 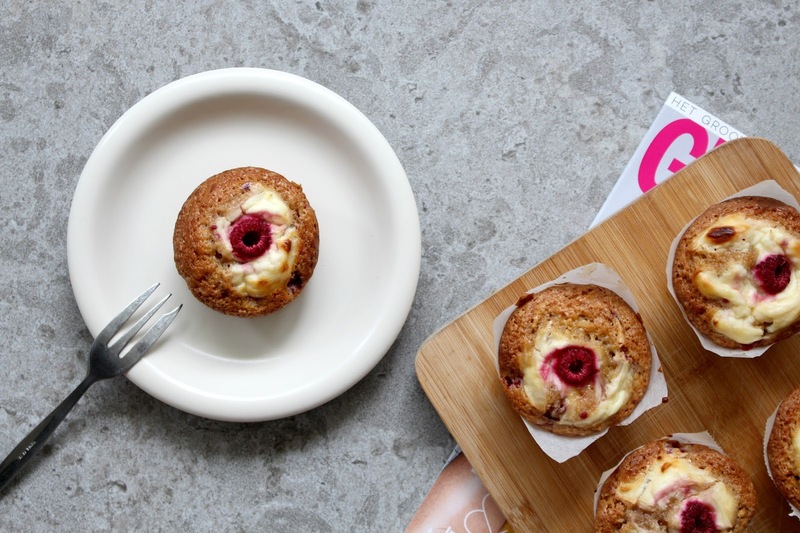 I saved the pretty raspberries for the top of the muffin. Grab another bowl and mix the cream cheese and 25g caster sugar together. Take a cupcake/muffin tray and place some muffin cases in the tray. I made mine with baking paper! I cut squares out of the paper and then did a small, vertical cut on each side (4 in total). It might look weird but when you place them in the tray it looks really good. They won't stay in place at first but once you scoop the dough in there it will be easier. Fill the muffin cases with the dough. I used a teaspoon for this since it's easier. Now it's time for the cream cheese mixture! Place half a teaspoon of the mixture on top of the dough and swirl it around. 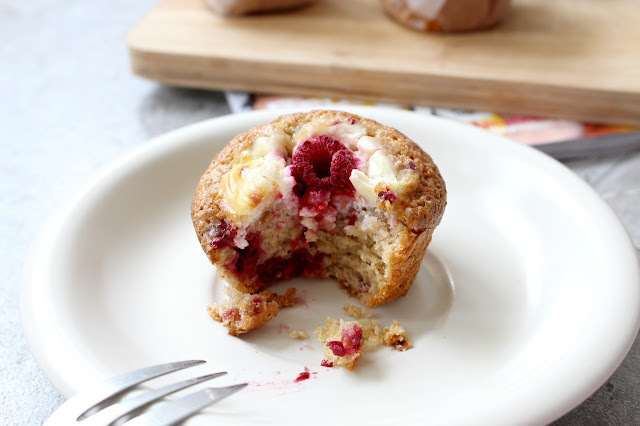 Take the leftover raspberries and press them down in the middle of the muffin and they are ready to go in the oven. The muffins will be ready in 25 minutes or until they are golden brown and risen. Take them out of the oven and let them cool down for a bit. By now, your kitchen will smell aaaamazing and you can finally take a bite out of a super moist and yummy muffin! Click here to see more of my baking posts!